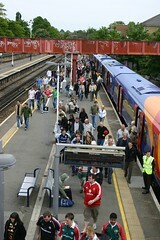 Twickenham railway station is nothing if not traditional. There was a refit a couple of years back but the new canopy hardly disguises the bleak 1950s architecture and when it rains water still tumbles through the roof and puddles on to the floor. At the top of the stairs up from Platform 4 the post-war feel is reinforced by the glassed-in display cabinet containing notices from the obscure Twickenham Society (is it a hoax?). They don't sell Oyster Cards. Yesterday at the little kiosk the woman in front of me asked for the Manchester Guardian. The Guardian moved to London in 1964; I don't suppose I have heard it called that in twenty years, but the newspaper was handed over without hesitation, and just for a moment I seemed to catch a glimpse of the old masthead. I bent down to take a Guardian of my own from the pile and, when I looked up, she was gone.